The Mousetrap is now touring the UK – Find out more! The Mousetrap has now been running for 60 years during which time over 23,000 performances have been given. It is quite simply a great piece of theatrical history because of what it is, a whodunit written by the greatest crime writer of all time. During this phenomenal run there have been no fewer than 297 actors and actresses appearing in the play, 86 miles of shirts have been ironed and over 320 tons of ice cream sold. Some cast members are in the Guinness Book of Records, David Raven as the ‘Most Durable actor’ for 4575 performances as Major Metcalf, and the late Nancy Seabrooke for a record breaking 15 years as an understudy. 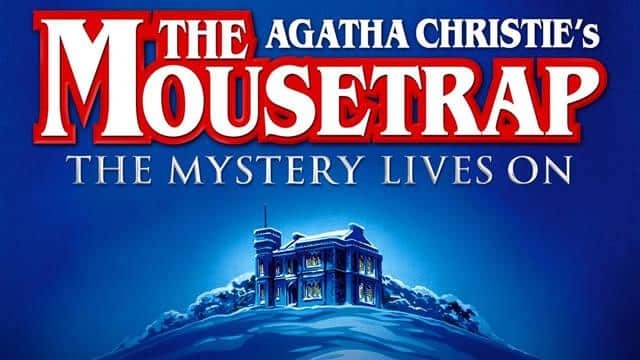 The Mousetrap first entered the record books many years ago on 12th April 1958 when it became the longest running show of any kind in the history of British Theatre. Join the millions who have already discovered whodunnit, but will not share their secret. The set was changed in 1965 and 1999, but one prop survives from the original opening – the clock which sits on the mantelpiece of the fireplace in the main hall. A staging at the Toronto Truck Theatre in Toronto, Ontario, that opened on 19 August 1977 became Canada’s longest running show, before finally closing on 18 January 2004 after a run of twenty-six years and over 9,000 performances. Agatha Christie herself though The Mousetrap would last eight months in the West End. Little did she know it would still be running today. 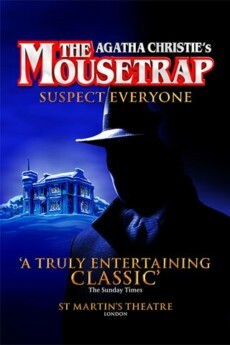 Britishtheatre.com offer great Group Booking rates to The Mousetrap. Just click the BUY TICKETS button on the top right of this page and then click the REQUEST A GROUP BOOKING option when asked the number of seats you require. Britishtheatre.com is the one-stop online box office for tickets to The Mousetrap and for the best seats to the best shows in London’s West End. Whether this is your first theatre experience or a seasoned fan of theatre we will do our best (together with our ticketing partners) to ensure that you get great deals on theatre tickets and the very best of service. We hope to facilitate your trip to The Mousetrap at London’s St Martin’s Theatre and hope that you enjoy the show. For over 60 years this Agatha Christie whodunnit has delighted audiences – it’s your turn to discover the culprit at The Mousetrap.